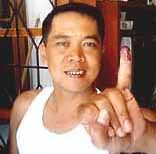 April 5: Polling day for 145 million Indonesians. During the short campaigning period. the streets were adorned with flags of each party. Tv, radio & press were saturated with party advertising. Megawati told us on Tv, "vote for the bull with the white nose". rented US$10,000 per day Boeing 737 jet, visiting poor villages across the archipelago. From midnight the friday before, no more ads or flags. The cooling off period. Election day was declared a public holiday. Polls opened 7am -1pm. Around 8 am Jamal & I went to our local polling station, set up in our Bunja, or street council meeting rooms. One of 550,000 stations nation wide, each allowed no more than 500 voters. Our station had 280 voters registered. Each voter needs a registration card, Jamal's was delivered a week earlier. On arrival you present your voter registration card and take a seat. After about 10 minutes your name is called, you pick up your voting papers and head for the aluminium screened booth. After voting you place one of your 4 voting papers in one of 4 locked boxes. Then your left small finger is dipped in indelible ink to prevent you voting again. The ink is imported from India. Over 2 million aluminium ballot boxes and aluminium screens had to be manufactured. Million of ballot papers printed. 150 million registration cards, a million bottles of indelible ink, all assembled and delivered throughout the archipelago by the Post Office. There were hold ups, ballot papers not printed days before. Thursday before the election, there was talk of postponement, but all went ahead as scheduled. An admirable effort considering it is only the second democratic election the country has held. Denpasar, April 17 (ANTARA) An earthquake measuring 5.6 on the Richter scale, followed by an aftershock measuring 4, hit the holiday island of Bali early Sat., panicking the residents of Denpasar and its surrounding areas. The quake struck at 2:32 a.m. local time. The magnitude of the tremor was felt at the districts of Jembrana, Tabanan, Denpasar, Kuta and Nusa Dua on the on the south coast of the island, but there was no report on fatality nor damage. were all awaken by the sound of the alarm and assembled beside the alarm in the small passageway outside the bedrooms. At this stage we could feel nothing, then the house violently shook. We estimate our earthquake detector gave us about 10 seconds warning more than enough time to run to the assembly point. In our previous time trials we found it takes 5 seconds to get out of bed and walk slowly to the assembly area. Fri Apr 24: 0950, the KHO Gempamometer alarm sounds. A 5.5 quake had occurred near East Timor, 820 km from the KHO. The quake, damaged dozens of buildings, including the East Nusa Tenggara governors office in the provincial capital Kupang. Some houses were also damaged. Many residents in Kupang fled their homes in panic when the tremor occurred. The epicentre was located some 62 kilometres under the Sawu Sea, about 130 kilometres west of Kupang. The tremor was felt far away in the Australian city of Darwin, more than 900 kilometre from the epicentre, said Darwin seismologist Clive Collins. May 1, John & Jamal depart from Denpasar with Royal Brunei Airlines, destination Bangkok, for a 2 week holiday. Scheduled dep. 1610 Arr. by Airbus 320 in Bandar Seri Begawan, Brunei at 1830. 1950 we dep. for Bangkok on a Boeing 767. We arrive at 2140 & will be met by friend Geof who lives in BKK. We plan to spend a few days in Bangkok then head to Nakhon Pathon, Kanchanaburi and over the famed River Kwae Bridge and on to Hellfire Pass, where 90,000 people, including 600 Australians lost their lives building the Burma Railway for the Japanese. Then on to Nakon Sawan, Sukhothai, Chaing Mai & Ayuthaya before returning to Bangkok. During the 2 weeks we will travel about 1400 kilometres, around 50% by train and 50% by bus. Thai train and Bus fares are very cheap, a 1st Class 2 bed private sleeper, with outside showers costs A$45pp from Bangkok to Chaing Mai. Thailand has a population or around 60 million. Bangkok around 7.5 mil. Mon Apr 26, Jamal's brother Deni, arrived at the KHO after the 25 hour bus trip from Bandung. He will look after the house and feed the cats while we are away. We checked around for the best fare from Bali to Bangkok, the cheapest was with Royal Brunei. Their fare was A$499 return. Royal Brunei has the distinction of being the only airline in the world with real gold plated seatbelt buckles and seat rests. Many passengers, especially 1st class, scrape the gold plating off. To remedy this, RB also has the distinction of having the only aircraft maintenance facility in the world with a gold smelter. International magazine. ''What's the incentive for you to open up your family estate, if you're absolutely awash in money? You don't want an army of tourists wandering around the estate.'' But Brunei wants to do more than just bring in tourists. The country is expanding its deep-water port to help spur its cargo business and recently signed a deal with the city of Brisbane, Aust., to feed cargo to Brunei, then out with the airline's network to the Middle East and Europe. On the 14th of May 1975 a Boeing 737s, bearing the nation's colours, thundered down the runway of the similarly new Brunei International Airport en route to Singapore, Royal Brunei Airline's first-ever scheduled service. Royal Brunei now provides scheduled services to 24 international destinations. 1,2m passengers were carried last year. The KHO media rack just got cooler than ever, after installing a turbo exhaust fan at the back. with a flue pipe to outside. 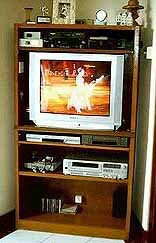 The fan was mounted on the back of the media unit and the exhaust duct connected and fed to the 3rd narrow shelf to cool the DVD and VHS machine, which previously got worrisomely hot. Pak Made's village, Batu Belig, to a girl he knows, who works in a villa. She had no room for him. Now Pak Made and family are looking after him, sending him to school and paying his school fees. In return, Putu is helping by doing chores in the restaurant in the evenings from 6-9 pm. , bed time. At first, Putu was fretting for his mother, but soon adjusted. 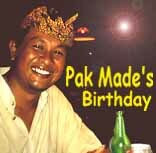 Putu has become good friends with Pak Made's youngest son Dendi and shares his room. This is great for Dendi, who has always been a lonely kid. In Indonesia often babies and children are abandoned. There are few orphanages, many family's adopt kids to help out. Sadly a huge percentage become street kids, turn to selling drugs, petty theft and prostitution, just to survive. Last month a painful lump appeared on John's foot, making it extremely difficult to walk. On close inspection you could see 2 puncture holes, most locals seem to think he was bitten by a scorpion. We are a bit sceptical about this because of the 2 puncture holes. Jamal's theory was that it was a small snake. My theory, a blood ant or a spider. something with 2 pincers. 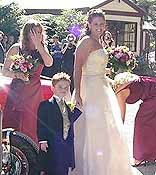 Saturday March 27, John's niece, Danielle was married at Micawber Tavern right on the edge of the Sherbrooke forest, Melbourne. 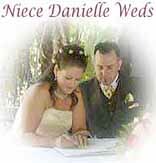 New husband Shane, Danielle and the group. For those of you who have never visited the KHO, above is a plan. The land is 10 meters wide, by 15 meters deep. The house has 10 rooms the smallest being the staff toilet. At the rear there is an upstairs balcony. which is used for entertaining and drying the clothes. The KHO kitchen could be more correctly described as a galley, only 2 x 3 meters, it is definitely on the small side. The stove, featuring 2 gas jets and a grill, known in Indonesian as "Kampor" runs on bottled LP gas. 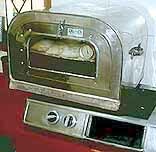 The stainless steel oven is unusual, it sits on one of the gas jets and can get very hot indeed. Want a Pizza? When not in use the oven is stored on a high shelf above the microwave oven. Dec. 1959, I left school after just passing Intermediate. I was not a good student, I was too busy with my other study agenda. I had no idea what I would do for a job, but I dreamt of working in a radio station or the wildest dream a Tv station. One day while pouring over the job adds there was an add in the Sun newspaper. HSV Channel 7, Melbourne was advertising for cadets, to train and work in television. We sent off an application, but after a week or so no reply. So mum rang Mr Fisher, God knows what she said to him, but I was to have an interview next week. The following day we did get a mail reply from HSV 7, to say I was not excepted. But clever Mum had got me an interview. Mum and Dad drove me to Melbourne, to the Channel 7 studios in South Melbourne. After a nervous wait I finally met Mr Fisher. He talked to me for more than ½ an hour, then sent me off to a new office area, to complete an exam. I was not shown around the studios, but I felt at home there, I liked the smell of the excitement. We returned home to Leongatha for the long wait of acceptance or refusal. Finally the call came I was to start work on Tuesday February 2, 1960. The wait was terrible. 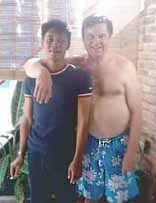 Finally I moved to Melbourne and stayed with my Godfather Colin Campbell and his wife Nancy in Oakleigh, while I found accommodation. My starting salary was £5.13.06 ($11.35) per week, after tax, hardly enough to find salubrious accommodation. Mr. Fisher suggested I try the YMCA on the corner of City Road and Sturt Street, about 20 minutes walk from the studios. A shared room with public bathroom, cost £3.13.06 per week, including breakfast. So I had $4.00 a week left to pay for my food and other expenses. I was to work in the audio department and train to be an audio operator. Tues. Feb 2, 1960, I arrived at the studios at 9 am. I was introduced to staff chief Graham Foster, who took me to studio 2 where they were presenting "Cooking with Gas" with Jean Ford. Jean was a well know Herald food journalist. I was introduced to audio operator, Lyle Hughes and boom operator, John Brennan. I was told to stay by the boom, not speak, not make any noise and just watch. It was fascinating, I couldn't believe it. Arrow shows my room on the 3rd floor. I lived there for 2 years. In the foreground the Trocadero Ball Room and Wirth's permanent circus. Now the site of the Victorian arts centre. The YMCA was demolished a few years ago. crewing all the different shows as well as Presentation, Telecine, Videotape and Master control. If someone was sick or late (as I ofen was) Graham would fill in. His assistant Ron Coster did the staff rosters and did his best to arrange consecutive days off, so I could return to Leongatha each month or so. This was not easy as in those days it was not common for us to work a 70 hour week. Management preferring to pay overtime rather than hire more permanent staff. Soon it was lunch time, off over the road from the studios to the RAAF canteen in a shed on the corner of Wells and Coventry St. Later this land was to be purchased by Channel 7, after many years of negotiation by Gerald Carrington. Studio 7 was build on the site. The greasy spoon served pies, milk shakes and a variety of fried in lard goodies. They were only open on week days for lunch. Crews working week-ends or nights either bought their own food to the studios or starved. Throughout the day live commercials were slotted in to the film programs. In those days, with no networking commitments, commercials often went far longer than scheduled. This was especially true on the opposition channel 9's . In Melbourne Tonight, Hall Todd, made it in the Guinness book of records as having presented the world's longest Tv commercial. I believe it was over an hour. Almost every night 7 did a live show. On staff was a band and ballet. There was a scenery building workshop and a wardrobe department complete with it's own staff of seamstresses. Plus freelance arrangers and writers. Thursday night was Club 7 with compere Frank Wilson, who went on to be a notable actor. Friday night was the big night of the week with Sunny Side Up. It was amazing how such a large show, plus audience were crammed into the restricted area of Studio 1. Little did many people realize the cameraman had his back against the rear wall, just to get a wide shot of a production number. There was not even room for the band, they played in the upstairs office area and the sound was fed back to the studio floor via a speaker. on to become a very successful businessman in electronics. Saturday's were particularly chaotic, especially during the football season. The Outside Broadcast (OB) football crew arrived around 8am to dismantle 3 of the 5 studio cameras the station possessed. Many other pieces of studio equipment were also removed for the day. When packed the van would head off the the ground where the VFL game of the day was being played. Often to Melbourne's famous Melbourne Cricket Ground, where the 1956 Olympics were held. I spent "100's" of Saturdays in the OB van, mixing audio for the football broadcast. Often it was freezing cold, poring with rain, blowing a gale or hailing. I was one of the lucky ones - the cameraman froze. Alf Potter directed the football, his wife Isabele always turned up at half-time with the most delicious vegetable and barley soup for the the whole crew. 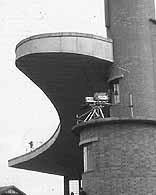 Technician Max Everett lines up a Marconi Mk 4 camera at the football. The camera's were huge by modern standards and only black and white. The camera came in 2 parts, the camera-head, which needed 4 men to carry and the Camera Control Unit (CCU) which was in the OB van or in the case of the studio in the CCU room. easy to watch and he never missed a kick. His cameraman trained almost as hard as the footballers themselves. Alf Always insisted on covering the full warm-up game, so when we went to to air with the Match-of-the-Day the 3 cameramen had already had 2 hours practice. Four hours of camera-work on the freezing cold was no mean feat. 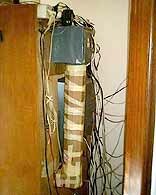 My responsibility was to mix the audio, set-up involved running microphone cables up into the commentators position in the stand. To be continued ........... Next Month, "Brian and the Juniors" & "Zig & Zag"
Ex HSV7 audio engineer, Harold Aspinal sent us this story. On this day, April 15th 1964, (I still have a copy of the running sheet to prove it!) the HSV-7 Fitzroy Teletheater (Melbourne, Aus.) was jumping to the strains of the "Liverpool Sound Show". Gerry & the Pacemakers, Brian Poole & the Tremeloes and the unmatched (before or since) Dusty Springfield. 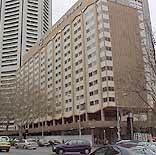 The now demolished Southern Cross Hotel, Melbourne. screaming from the audience. The show broadcast a few weeks later on the 7 network. The 'wrap' party, also at the Southern Cross that night, was something to remember. I had a chance to have a brief chat with Dusty Springfield, a charming young lady just starting out on her exciting career. For me a highlight of my 4 years at HSV7. Sadly Dusty Springfield died at the age of 60 of cancer on Mar 2, 1999. Melbourne to host the world premiere of a new $8M musical, written by John-Michael Howson, David Mitchell and Melvyn Morrow. All of whom collaborated to produce the Johnny O'Keefe show “SHOUT”. Mike Walsh will be producer. The show will open at Her Majesty's on Jun 24. Seasons in London and the US hopefully will follow.